These supplies are basic recommendations based on our experience. It will be helpful to have these supplies ready at home before the day you pick-up your puppy. All of the supplies can be purchased at any pet supplies store in your area. 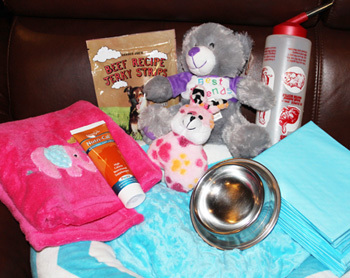 **All of our puppies are comes with Puppy Starter Kit include sample food, Nutri-cal, chew toys, and some pee pads. 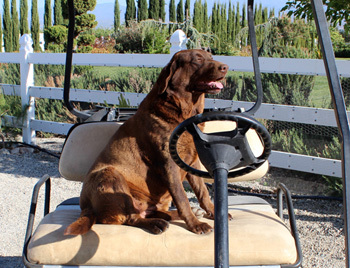 Meet our family dog "Marley"
Dogs may be susceptible to motion sickness just like humans. For the first few times the puppy rides in car, he/she may get carsick. It is normal for little baby puppy, so be prepare paper towels or Wee-Wee pads just in case. Also, being held in someone’s lap can make him/her feel comfortable to trip home and may help prevent car sickness. Car sickness generally vanishes and soon your puppy will look forward to going “For a ride”. Your puppy might be nervous in new environment. Everything from sights, smells, people, etc. are strange and very new to him/her. You have to allow new puppies to explorer the place and encourage him/her to play. When you speak to your new puppy, you need to speak quietly and calmly so he/she can be comfortable with your voice. He/she will soon be just fine and enjoying his/her new home. The puppy is used to sleeping with several brothers and sisters, so he/she might fell lonely and cry for first few couple for night. When the puppy cries out, simply touch his nose and tell him ‘no’ in a soft voice. The only thing you tell him when the new puppy cries out is softly but firmly ‘no’. To put small table clock under the bed is another good idea. The clock sound makes puppies to think that they hear their mom’s heartbeat. All our puppies are currently on Royal Canin Mini Starter. However, changing environment is big stress for tiny, young puppies and some may stop eating food due to stress from changing environment. If your new baby doesn’t eat his/her food, we suggest feed him/her the mixture of dry/canned food. First place ½ of a cup of dry food in the bowl, then add 1-2 tablespoons of canned food and mix well. Always make sure your puppy eats this mixture of food. You need to feed this mixture of food every morning and night until your puppy start to eat dry food by his/her own. (You have to leave the food out at all times while you’re giving mixture of food). Once your puppy starts to eat dry food, you can leave the food out all times or you can start feeding once daily. The puppy needs vitamin and calcium in their body when they are a baby. So you have to give Nutri-cal or Nutri-stat by mouth 3-4 times a day. -Meats: meats should be boneless and it is best if the skin is removed. Do not overcook the meat. Keeping it rare will not kill the enzymes which is good for sick dogs. All fish and pork must be well cooked. Totally raw and cooked diets should never be mixed at the same meal as they digest differently. -Cottage cheese: blending a little bit of cottage cheese into standard dry food makes yummy doggie diet! -Chocolate: contains theobromine. It will increase dog’s heart rate or may cause the heart to beat irregularly. It also can cause vomiting, diarrhea, seizures, hyperactivity, coma and increase thirst, urination. Death is quiet possible. Caffeine & Cacao may burst red blood cell & nerve. -Raisin & grapes: can cause kidney failure in dogs. A little as a single serving of raisins can kill a dog. -Macadamia nut: can cause weakness, muscle tremor and paralysis. -Spoiled food: May contain pathogens, mold, and mycotoxins that can cause GI irritation, tremors, seizures, and death. All food, regardless of shelf-life claims, loses value and may grow toxins over time. -Alcohol: Can cause gastrointestinal irritation, drunkenness, tremors, difficult breathing, panting, coma and even death. -Yeast dough: the yeast dough can cause two problems in that as it rises, the dough can expand the GI tract, possibly causing the intestine to rupture. The yeast can also form alcohol as it rises, leading to alcohol poisoning. -Coffee grounds, beans & tea (caffeine): drinks and foods contains caffeine can cause many of the same symptoms as chocolate. - Table Scraps (in large amounts): Table scraps are not nutritionally balanced. They should never be more than 10% of a dog’s diet. Fat should be trimmed from meat; bones should not be fed. -Animal Fat & Fried Foods: Excessive fat and grease can cause pancreatitis. -Bones from meat sources: Bones can splinter and choke or damage a dog’s internal organs. -Cooked Fish: Do not feed Tuna due to its high mercury content. Be careful of small bones in any fish. -Raw Fish: Can result in to vitamin B deficiency leading to loss of appetite, seizures, and in severe cases, death. More common if raw fish is fed regularly. -Raw eggs: Raw eggs can cause salmonella poisoning in dogs. Dogs have a shorter digestive tract than humans and are not as likely to suffer from food poisoning, but it is still possible. -Mushrooms: Can contain toxins, which may affect multiple systems in the body, cause shock, and result in death. -Avocados: The fruit, pit and plant are all toxic. They can cause difficulty breathing and fluid accumulation in the chest, abdomen and heart. -Pepper: Can irritate the skin, eyes, nose and gastrointestinal tract. -Salt or Salty Foods: Can result in sodium ion poisoning with symptoms of regurgitation, tremors, excessive thirst, diarrhea, high fevers and seizures. Small amounts of natural salt can be healthy but excessive salt intake can cause kidney problems. -Sweetener: From candy and gum can also cause a fairly sudden drop in blood sugar, resulting in depression and seizures. Hypoglycemia (low Blood Sugar) is disorder that occurs mainly in toy breeds between 5 to 16 weeks of age. Hypoglycemia attack is often precipitated by stress and can occur without warning. It also usually happens due to lack of food, or by using up all stored energy without being replenished (playing/running for long period of time, being chilled or over handled). Hypoglycemia is completely preventable. It is much easier to prevent hypoglycemia than treat it. For first few days after you bring your puppy, I strongly advise you to check the food every few hours. You must make sure your puppy eat his/her food every 3-4 hours even if it is small amount and even if you have to hand feed your puppy. If your puppy doesn’t eat the food, please call me right away so I can advise you other options of feeding to make sure your puppy does not become hypoglycemia. Nutri-cal or Nutri-stat are wonderful products for preventing hypoglycemia. I recommend using 3 times a day, especially first thing in the morning, after playtime and before bed. Just squeeze about a pea size of paste on your finger and the puppy will lick it from your finger by him/herself or you can just rub on the roof of puppy’s mouth. Nutri-cal and Nutri-start are can be found easily at any pet supplies stores. Please call me immediately if your puppy has any signs of hypoglycemia or if you even think your puppy may have hypoglycemia. You can call me at any hour, during night times too! I’m here for you 100%. Hypoglycemia is real threat to tiny puppies. The puppy with hypoglycemia ay exhibit one or more of following signs. Make sure you stay calm if this happens and follow the direction. Do this before you call for help. The sooner is the better. 1. Gums of normal puppy will be bright reddish/pink just like human gums. Gums that are pale in places or light pink may indicate the blood sugar levels are dropping. Gums that are white, your puppy need quick attention to avoid a hypoglycemia. When the gums are pale pink or pink in spots, you may give 3-4 pea size globs of Nutri-cal to restore your puppy’s blood sugar level. If you do not have Nutri-cal, you may use about 5 to 8 drops of Karo syrup, honey or pancake syrup to raise your puppy’s sugar level. It will bring the sugar level up to normal around in about 10 minutes. 2. Another sign that may be seen is vomiting clear or greenish bile. Foamy saliva may also appear at your puppy’s mouth. These symptoms are usually evident when the puppy has not eaten in a while. You need to give your puppy Nutri-cal, then a protein based food as fast as possible. 3. More signs are: acting listless and tired, walking with unsteady walk as if they were drunk, shakiness, falling over and if extreme cases, even laying on their side and being totally unresponsive. This is an EMERGENCY and your puppy must be given some type of sugar immediately (some cases by prying their mouth open)! For severe cases, I recommend Karo syrup. For preventative and mild cases, I recommend Nutr-cal or Nutri-stat. After giving a form of sugar, wrap your puppy in a blanket to keep them warm. If heating pad or electric blanket is available, set it to low and use it to help warm up your puppy. Wait and you should see improvement and your puppy will be more alert in about 10 minutes. If there is no improvement, give more sugar. When your puppy perks up and feel little better, give him/her protein based meal (meat canned dog food or meat baby food) so the puppy’s blood sugar can level out. EMERGENCY SITUATION: Take your puppy to a vet immediately if you see no signs of improvement or responsiveness, or if your Yorkshire puppy appears comatose. Rush to the vet for a glucose injection or a I.V to save their life! Remember to put that sugar in their mouth before you leave. Some of it can still be absorbed and might help. 1. Puppy that does not receive enough nutrition may have hypoglycemia. Just because your puppy has a bowl of food does not mean they are eating. Make sure you actually see your puppy eats their food. 2. Over handling your puppy and not allowing them to get enough rest. I know how you feel when you get a new puppy and you just want to play with them but please remember that they are babies and need lots of sleep (up to 16 hours a day). 3. Stress of changing environment (new home). Please pay attention to your new puppy when you take them home. It is quite transition for them. Most of them adjust very quickly at their new home and family but some will become very stressed and stop eating. 4. Changing your puppy food can cause diarrhea, resulting in hypoglycemia. Vaccination is the only way to protect your dog against certain viral diseases that are highly contagious, and can be fatal. -After 16 weeks: Rabies given by your local veterinarian (age at vaccination determined by local law). Annual vaccination is recommended to keep antibody levels high throughout life. Vaccination programs will vary with age of first vaccination and the type of vaccine used. Your vet will advise you of the best program for your dog. Reactions to vaccinations are rare. Your dog may be a little lethargic for a day or two after vaccination. Sometimes there may be a little swelling or tenderness at the injection site. These are not causes for alarm but if you are concerned about your dog or if there are more serious signs then it is advisable to contact your veterinarian immediately. All puppies will have intestinal worms during their life time and deworming your puppy is highly recommended to keep your puppy healthy and strong. Since roundworm can cause illness in humans, especially children, puppies need to be wormed every 2 weeks from 4 to 12 weeks of age, then monthly to 6 months, then at 3 monthly intervals afterwards. **If your puppy does not seem normal, please DO NOT give vaccines or worm medicine at this condition. If your puppy has loose stool without their diet being changed or if they just don't seem right to you, please call us first immediately and take them to the vet. Supervise your puppy by having it in a confined area, or on a fairly long lead. This way you can help the puppy learn how and what to play with, and where and when it can go to the toilet. Puppies will go to the toilet after waking up and after eating. Take your puppy to the place where you would like it to go to the toilet, such as on newspaper in a corner, or outside and use a command such as ‘Empty’, or ‘Hurry Up’. Providing a reward in the form of a special food treat or lavish praise will give the puppy incentive to repeat this behaviour. This is called positive reinforcement. If your puppy shows signs of going to the toilet such as circling or squatting, take it to its toilet place without reprimand, give your command, and then praise when the puppy goes to the toilet. Even if he or she makes a mistake, never punish, as it will make the matter worse (probably because the dog can become anxious and it will try to wait to go to the toilet when the owner is away). Rubbing the dog’s nose in the urine or faeces is notoriously ineffective at housetraining. If a reprimand is needed, a loud ‘no’ is sufficient to distract the puppy so that you can then redirect him to the correct area. When cleaning up mistakes, use an odour neutralising agent. When you cannot supervise your puppy, such as during the night, confine him to a secure area that contains his bed and toys and an area covered with paper for his toilet. Young puppies will require this as they need to eliminate every 3 to 4 hours, but this period lengthens as the puppy grows. Give your puppy an opportunity to go to the toilet before bedtime and then as soon as you get up, with the system of rewards and positive reinforcement, and your puppy will soon make it through the night. Remember to accompany your puppy outside so that you can immediately reward him. This secure area in which to confine your puppy when you go out, or overnight, should be the kitchen or bedroom, and not isolated areas like the laundry. If you only need to leave the puppy for a couple of hours, a crate or cage can be used. Immediately clean up accidents and use an odor remover. If you catch your puppy having an accident, take them immediately to the designated toilet area. You may even need to leave a small amount of waste in the spot to help your puppy understand that this is their potty area. Don't discipline the puppy if you find an accident after the fact. Your puppy will not understand what the scolding is for. There are many good training materials to help you; books, videos, professional trainers, and pet care associates. Paper training may be an acceptable alternative for a small apartment dog whose owner is not able to take him outside regularly. Consider putting the paper on the floor in the corner of an indoor exercise pen. You might also consider housebreaking pads, which have a scent that attracts puppies to urinate in your chosen spot.